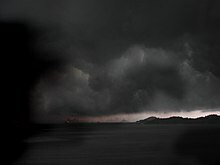 New England's Dark Day (19 May 1780) was a date when an abnormal darkening of the day sky was observed over the New England states and parts of Canada. Speculation exists that this was due to a combination of smoke from forest fires and a thick fog. The darkness was so complete that candles were required from noon until midnight, when it finally dispersed and the stars could be seen. In some places, the darkness was so great, that persons could not see to read common print in the open air, for several hours together: but I believe this was not generally the case. The extent of this darkness was very remarkable. The darkness of the following evening was probably as gross as ever has been observed since the Almighty fiat gave birth to light. It wanted only palpability to render it as extraordinary, as that which overspread the land of Egypt in the days of Moses .... if every luminous body in the universe had been shrouded in impenetrable shades, or struck our of existence, the darkness could not have been more complete. A sheet of white paper held within a few inches of the eyes was equally invisible with the blackest velvet. Considering the small quantity of light that was transmitted by the clouds, by day, it is not surprising that, by night, a sufficient quantity of rays should not be able to penetrate the same strata, brought back the shifting of winds. to afford the most obscure prospect even of the best reflecting bodies. This page was last edited on 12 November 2014, at 10:03.